The Smooth Collies are loyal, trainable, affectionate and kind. They share the same temperament traits as the Rough Collie and are recognized to be excellent with children. The Smooth Collies like to keep busy however they possess a calm nature. Regular outdoor activity is needed to keep the Smooth Collie in condition and, because of its size, it is better equipped to suburban or country living. Size: Adult males will measure 24-26 in, 61-66 cm at the shoulder and weigh 60-75 lb. The women will measure 22-24 in,and weigh in at about 50-65 lb. 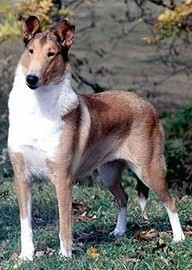 Coat: The Smooth Collie carries a short, hard, dense, flat outer coat over an abundance of undercoat. Grooming: Thorough and regular brushing are all that`s required.